The eudicots, Eudicotidae or eudicotyledons are a clade of flowering plants that had been called tricolpates or non-magnoliid dicots by previous authors. The botanical terms were introduced in 1991 by evolutionary botanist James A. Doyle and paleobotanist Carol L. Hotton to emphasize the later evolutionary divergence of tricolpate dicots from earlier, less specialized, dicots. 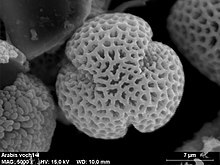 The close relationships among flowering plants with tricolpate pollen grains was initially seen in morphological studies of shared derived characters. These plants have a distinct trait in their pollen grains of exhibiting three colpi or grooves paralleling the polar axis. Later molecular evidence confirmed the genetic basis for the evolutionary relationships among flowering plants with tricolpate pollen grains and dicotyledonous traits. The term means "true dicotyledons", as it contains the majority of plants that have been considered dicots and have characteristics of the dicots. The term "eudicots" has subsequently been widely adopted in botany to refer to one of the two largest clades of angiosperms (constituting over 70% of the angiosperm species), monocots being the other. The remaining angiosperms include magnoliids and what are sometimes referred to as basal angiosperms or paleodicots, but these terms have not been widely or consistently adopted, as they do not refer to a monophyletic group. The other name for the eudicots is tricolpates, a name which refers to the grooved structure of the pollen. Members of the group have tricolpate pollen, or forms derived from it. These pollens have three or more pores set in furrows called colpi. In contrast, most of the other seed plants (that is the gymnosperms, the monocots and the paleodicots) produce monosulcate pollen, with a single pore set in a differently oriented groove called the sulcus. The name "tricolpates" is preferred by some botanists to avoid confusion with the dicots, a nonmonophyletic group. Numerous familiar plants are eudicots, including many common food plants, trees, and ornamentals. Some common and familiar eudicots include members of the sunflower family such as the common dandelion, the forget-me-not, cabbage and other members of its family, apple, buttercup, maple, and macadamia. Most leafy trees of midlatitudes also belong to eudicots, with notable exceptions being magnolias and tulip trees which belong to magnoliids, and Ginkgo biloba, which is not an angiosperm. The name "eudicots" (plural) is used in the APG system, of 1998, and APG II system, of 2003, for classification of angiosperms. It is applied to a clade, a monophyletic group, which includes most of the (former) dicots. "Tricolpate" is a synonym for the "Eudicot" monophyletic group, the "true dicotyledons" (which are distinguished from all other flowering plants by their tricolpate pollen structure). The number of pollen grain furrows or pores helps classify the flowering plants, with eudicots having three colpi (tricolpate), and other groups having one sulcus. Pollen apertures are any modification of the wall of the pollen grain. These modifications include thinning, ridges and pores, they serve as an exit for the pollen contents and allow shrinking and swelling of the grain caused by changes in moisture content. The elongated apertures/ furrows in the pollen grain are called colpi (singular colpus), which, along with pores, are a chief criterion for identifying the pollen classes. The eudicots can be divided into two groups: the basal eudicots and the core eudicots. Basal eudicot is an informal name for a paraphyletic group. The core eudicots are a monophyletic group. A 2010 study suggested the core eudicots can be divided into two clades, Gunnerales and a clade called "Pentapetalae", comprising all the remaining core eudicots. ^ Endress, Peter K. (2002). "Morphology and Angiosperm Systematics in the Molecular Era" (PDF). Botanical Review. Structural Botany in Systematics: A Symposium in Memory of William C. Dickison. 68 (4): 545–570. doi:10.1663/0006-8101(2002)068[0545:maasit]2.0.co;2. JSTOR 4354438. ^ Coiro, Mario; Doyle, James A.; Hilton, Jason (2019-01-25). "How deep is the conflict between molecular and fossil evidence on the age of angiosperms?". New Phytologist. doi:10.1111/nph.15708. PMID 30681148. ^ Sporne, Kenneth R. (1972). "Some Observations on the Evolution of Pollen Types in Dicotyledons". New Phytologist. 71 (1): 181–5. doi:10.1111/j.1469-8137.1972.tb04826.x. ^ Worberg, A; Quandt, D; Barniske, A-M; Löhne, C; Hilu, KW; Borsch, T (2007). "Phylogeny of basal eudicots: insights from non-coding and rapidly evolving DNA". Organisms, Diversity and Evolution. 7 (1): 55–77. doi:10.1016/j.ode.2006.08.001. ^ Soltis, Douglas E.; Soltis, Pamela S.; Endress, Peter K.; Chase, Mark W. (2005). Phylogeny and Evolution of Angiosperms. Sunderland, MA: Sinauer Associates. ISBN 9780878938179. ^ Moore, Michael J.; Soltis, Pamela S.; Bell, Charles D.; Burleigh, J. Gordon & Soltis, Douglas E. (2010). "Phylogenetic analysis of 83 plastid genes further resolves the early diversification of eudicots". Proceedings of the National Academy of Sciences. 107 (10): 4623–8. Bibcode:2010PNAS..107.4623M. doi:10.1073/pnas.0907801107. PMC 2842043. PMID 20176954. Stevens, P.F. (2001–2014). "Trees". Angiosperm Phylogeny Website. Retrieved 2014-11-17. Stevens, P.F. (2001–2016). "Eudicots". Angiosperm Phylogeny Website. Retrieved 2014-11-17. ^ Angiosperm Phylogeny Group (2016). "An update of the Angiosperm Phylogeny Group classification for the orders and families of flowering plants: APG IV". Botanical Journal of the Linnean Society. 181 (1): 1–20. doi:10.1111/boj.12385. Doyle, J.A. ; Hotton, C.L. (1991). "Diversification of early angiosperm pollen in a cladistic context". In Blackmore, S.; Barnes, S.H. Pollen and Spores. Patterns of Diversification. Systematics Association Publications. 44. Clarendon Press. pp. 169–195. ISBN 9780198577461. Judd, Walter S.; Olmstead, Richard G. (2004). "A survey of tricolpate (eudicot) phylogenetic relationships". American Journal of Botany. 91 (10): 1627–44. doi:10.3732/ajb.91.10.1627. PMID 21652313. Eudicots in Stevens, P. F. (2001 onwards). Angiosperm Phylogeny Website. Version 7, May 2006. Wikimedia Commons has media related to Eudicots.